Look! Up in the sky! It’s a bird! It’s a plane! It’s… it’s… yeah, it’s a bird. Humour me for a moment. If you’re re-booting the Superman movie franchise for the second time in less than ten years, why not return to the original source material of the initial Siegel and Schuster stories, in which the man of steel bore only a surface resemblance to the clean-cut, heart-of-gold do-gooder we know and love (and frankly, also find a wee bit boring, if truth be told) today? For in the early days the only surviving son of Krypton was quite the badass: aggressive, quick-tempered and given to regular (and, often, presumably fatal) beat-downs of domestic abusers, gangsters, and even the odd lynch mob. Since in his cine-verse avatar Superman is pretty much the sole superhero who has stayed stubbornly one-note, it might be gratifying to instead see an actual character arc, a journey from being an almost amoral thug-thumper to a kinder, gentler Kal-El who must struggle to keep his fist-first-ask-questions-later instincts at bay. As it stands though, Zack Snyder and co went the old tried and tested way: origin story of Krypton’s demise, Jor-El and Lara sending off their newborn hurtling to Earth, little Kal-El being found by the Kents and then growing up trying to come to terms with his decidedly unearthly powers. And that’s it. Seriously. A 143-minute runtime and there’s no Lex Luthor, no bespectacled-reporter-at-The Daily Planet secret identity (not until the last moment anyway), even poor Jimmy Olsen and his trusty camera are nowhere to be seen. Instead, we get a painfully extended screen-time on the dying planet, where Jor-El (Crowe, lumbering and miscast) seems to be in a glowering contest with the sneering General Zod (Shannon). The two bellow and pontificate upon the reasons for their world’s destruction and argue over something or other that has to end up in the military guy taking out the peacenik, thereby setting up the former as the future man of steel’s first major adversary. At this point, one can’t help but think of the Richard Donner/Richard Lester-directed second Superman feature (1980), in which the electrifying Terence Stamp essayed a rather different version of Zod; more camp, certainly, but also far more coldly menacing a villain than this psychological train wreck, whom, try as you might, you just can’t take seriously. 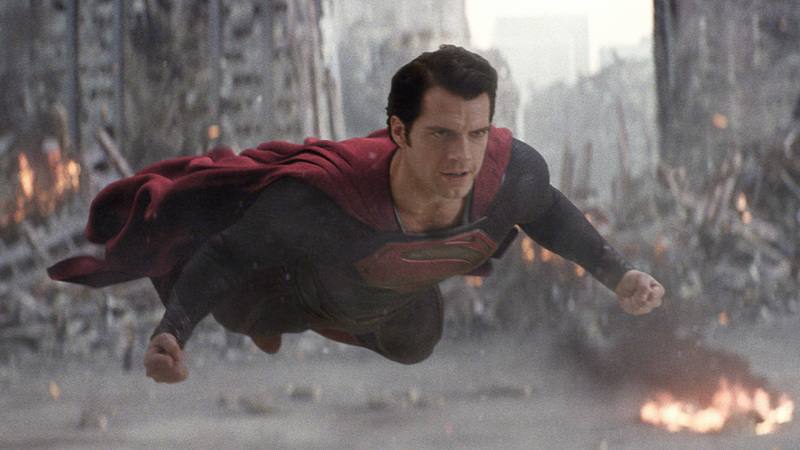 The rest of the film involves the grown-up Kal/Clark Kent (Cavill) grappling with the implications of his true identity, meeting perky reporter Lois Lane (Adams), saving humanity from Zod’s nefarious designs, and making the monumental (and questionable) decision to wear his fire engine-red briefs underneath his superhero gear. All well and good, but does it make for compelling cinema? Does it keep you riveted? Let me put it this way: what is Kryptonian for ‘meh’? Strangely enough, the minds behind the movie have thrown everything they could think of into the mix – 3D, CGI sets and action sequences galore, more name-star appearances than Oscar night – but they left out one crucial ingredient that the aforementioned earlier Superman film(s) got so right: a sense of fun. Man of Steel, to put it plainly, is astoundingly joyless; you never feel that heart-pounding elation that you’re supposed to when Supes takes to the sky for the first time, for example. His struggle with honing his powers is also played for somber reflection rather for goofy entertainment. Kal is the one with the weight of the world on his shoulders but it’s the audience who feels pulled down. ‘Lighten (him) up, Zack’! you may find yourself shouting as our superhero broods again. And by the time Zod and his heroic nemesis have barreled forcefully into each other (or a skyscraper or two) for the nth time, you may even find yourself rolling your eyes heavenward. Not much meat to be had on this bone, sadly, and by the point the narrative finally gets jaunty, it’s almost time for the end credits. This is all the more regrettable because Englishman Cavill proves himself quite a winning presence in the title role (though he’ll have to work much harder to even remotely match the towering shadow of the late, great Christopher Reeve), and Adams is a delightful foil. Too bad this man of steel is able to fly only physically, and not in spirit. Cult: Superman: The Movie (1978) – Christopher Reeve re-icon-ised an existing icon, creating an unforgettable onscreen Superman with a performance yet to be surpassed. Current: Iron Man 3 – Let Tony Stark (Robert Downey Jr.) show you how to play it cool. And fun. Lots of fun. Coming Attraction: The Avengers 2 (2015) – Joss Whedon will helm the sequel to his enormously successful first outing about a motley crew of superheroes.